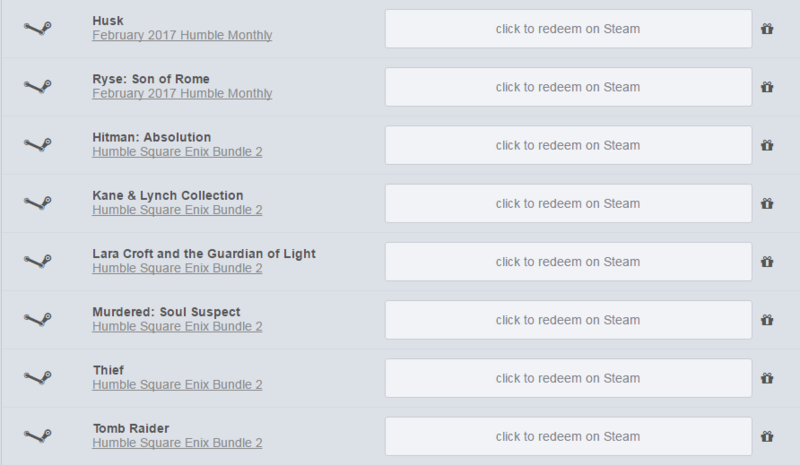 So I actually have a few games that I got from humble bundles that I want to give away (Not interested in the games and it would be a shame if the keys got wasted). I was hoping some people here might want them. Now for the formal list. Husk: Apperantly a new horror game that was released today. I cannot stand horror so here it is. Apperantly also involves drunk domestic violence? Trigger warnings apply and all, I have no idea what is in this. Kane and Lynch Collection: Actual contents are in a subpackage on the page. Tomb Raider: Apperantly this is good, just not my thing. Dibs on Hitman Absolution and Ryse. I hear they're garbage and I want to do... something with them. Murdered soul suspect looks neat. The only ones I have any prior knowledge about are the bottom two. I've heard more positive things about Tomb Raider of them. However, none stand out to me as interesting to me either. Thanks for offering, though. Gravy are you actually interested in Thief or should I dump the link on someone else? Give it to someone else if someone is interested. I haven't checked it out yet because I was out of town earlier and now I'm on here during a ten minute gap, but I'll still take it most likely. Alright just checking, I'll keep it on hold then for you. 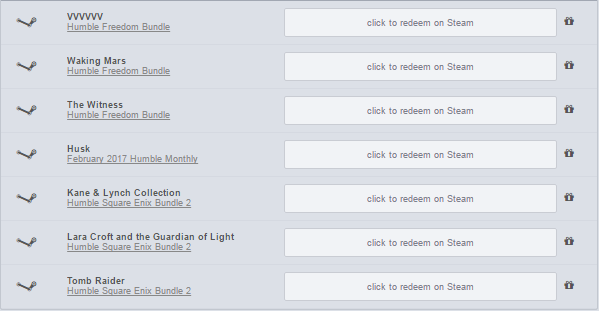 UPDATE: Got the freedom bundle and the games I was interested in out of it. Here's updated list. Feel free to see what you want. I either have them or am not interested. I'll take Sproggiwood and Read Only Memories I guess? Ninja pizza girl looks interesting? May I tske that? There's nothing more animu in there. I remember you recommending it before. Before even reading this post, I was thinking this a good opportunity to try it. @Tankman101 Thank you again for offering. Rightio, just tell me when you finish so I can send them all in one batch. And no problem. I figure that if I won't use the codes someone else will. 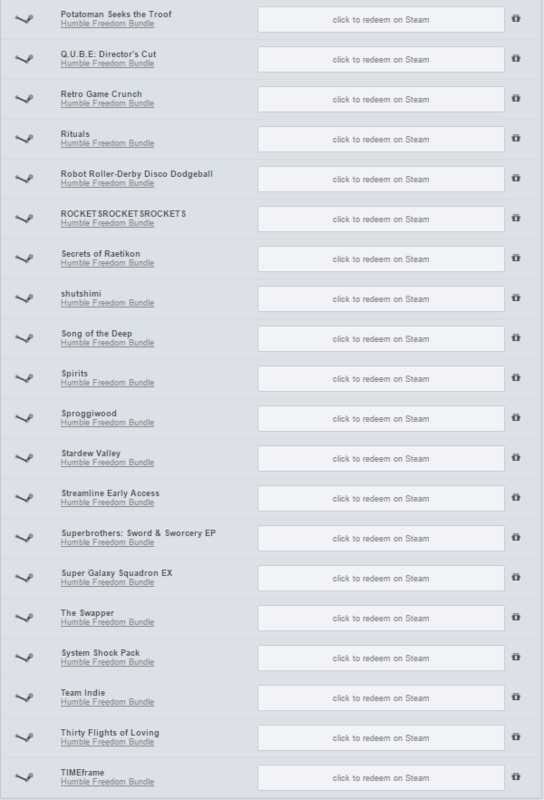 Wow you have alot of games, any chance the following is up for grabs? The Witness, Stardew Valley and Nuclear Throne. Well that's unexpected. Dunno how you found this but sure. Stardew Valley is taken already but the others are up. Welcome to the community, Yuuyami. 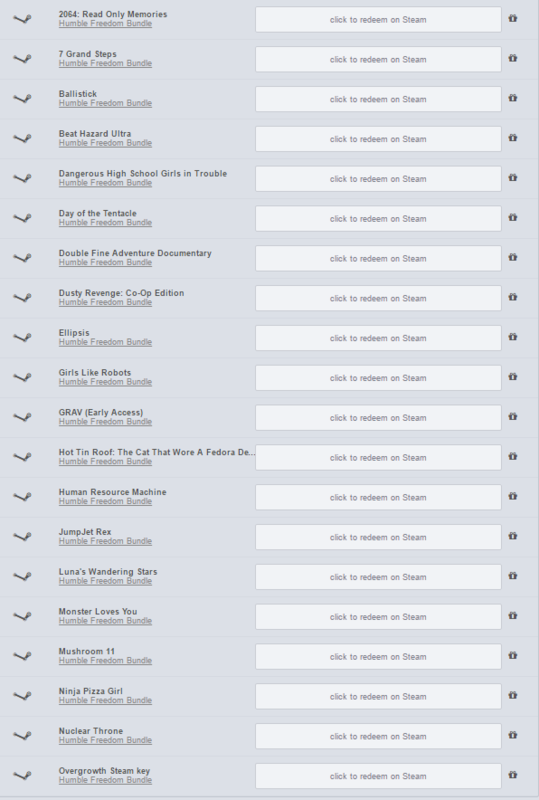 As for the games I claimed earlier, since last time, I haven't been able to go through the list, but I plan to soon. Thank you for sharing these. I am downloading them now. No problem, enjoy the games.